No matter what season we are in, sunscreen is very important. A higher SPF doesn’t necessarily mean significantly better coverage if you don’t reapply often enough. Reapply sunscreen after swimming or perspiring heavily. If not, reapply approximately every 2 hours, even on cloudy days. You need at least an ounce or a shot glass of sunscreen to completely protect the exposed parts of your body. Of course do adjust the amount by your size. Mineral/physical sunblock (zinc oxide or titanium dioxide) may be less irritating to the skin. I discovered this at a baby pharmacy this summer. My rationale is that if it’s supposedly gentle enough for a child, then it should be fine for an adult. 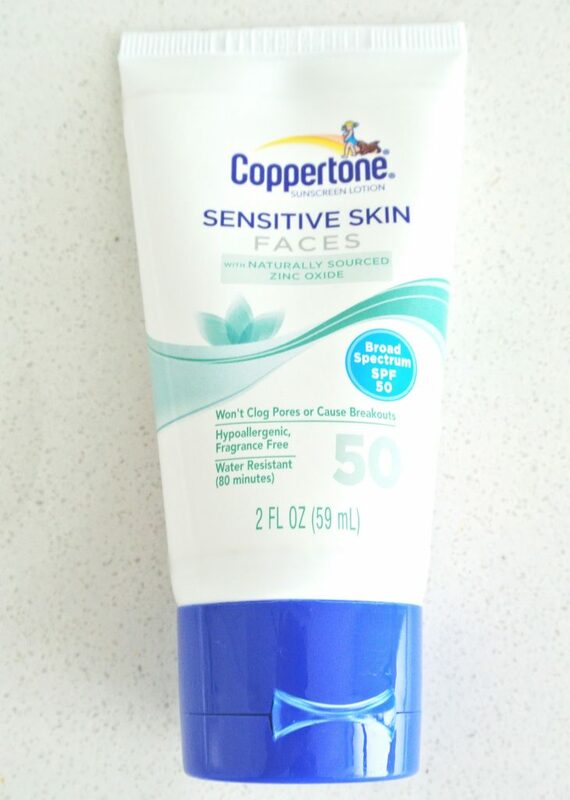 Coppertone is also an evergreen sunscreen brand, so I wasn’t expecting it to underperform. It passed my checklist with flying colours. I didn’t get any breakouts and nor itch. Check one! It provided good coverage (broad spectrum UVB & UVA), I didn’t get sunburnt and no new sunspots appeared. Check! It is water resistant. Check! This contains zinc oxide and doesn’t have a strong scent. It is gentle on skin and best of all, does not cost much. Check! Check! I even use it for my body although it says it’s for faces. I would reserve this for outdoor activities as it’s on the slightly heavy side and leaves a slightly white dewy film, rather than under make up for daily use. I remember one trip in Paris dragging one of my best friends around the pharmacies when all she wanted to do there was buy some Evian on a hot summer day. I was focused on finding a good body sunscreen in a spray form that was light. Not surprisingly, I veered back to Avene again! I found this. Formulated for “hypersensitive skin’’ and mainly due to its spring water content, it doesn’t irritate my skin even after a full day in the sun through perspiration/swimming and reapplying. It is paraben free and has no chemical filters. The spray bottle makes it easy to apply. The spray dispenses a good amount per time. It is water resistant and per its name, has high broad spectrum UVB and UVA protection. I like its texture -light and lotion-like, is non-greasy and doesn’t leave a white cast on skin. This sunscreen has a subtle powdery scent that’s fine for even men to use. This can be used on the face and body. It lives up to its water resistant claim – it requires some effort to wash off. Aside from that, overall a great product. Not exactly cheap in Asia, but worth it.